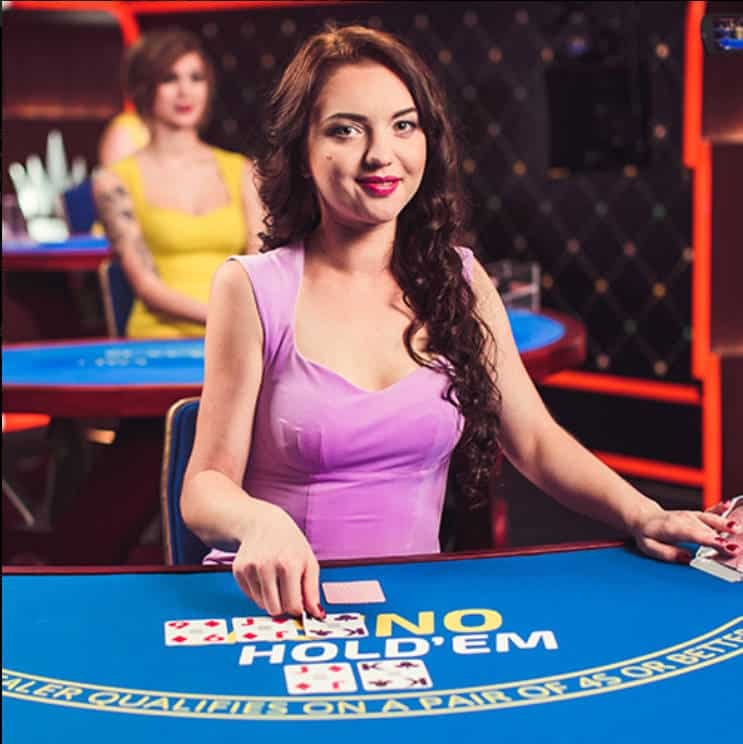 Ezugi Live Casino Holdem is a single deck, single handed poker game that is played with a Live Dealer. It’s essentially the same game as you’ll find at Playtech and Evolution Live Casinos. However Ezugi has added their own unique presentation to it and it’s very good. The table is streamed live from their studio in Bulgaria with English being the main table language. Live Casino Hold’em is a fast, fun game that’s easy to learn and play. All you need is a basic understand of the value of 5 card poker hands, a small bankroll and you’re away. Ezugi Live Casino Holdem can be played on Desktop, tablet and mobile devices. Watch my video review below to see the game in action. The game has been designed so an unlimited number of people can play the same hand. You’re able to make your own playing decision and nothing that anyone else does will effect the outcome for you. Live Casino Hold’em is based loosely on Texas Hold’em poker. The player and dealer are both dealt two cards, followed by the Flop of three cards. Rather than trying to out fox your opponent, in this case the dealer, you have to make a simple decision. Do you play the hand or fold. There is no bluffing required or raising to get the dealer to fold. It’s a straight race to see who has the best 5 card poker hand. If you decide to play, the turn and river cards are dealt. The showdown, reveals the dealers hand. The two hands are compared with the better poker hand winning. However in Live Casino Hold’em there is a difference from regular Poker. The dealer needs to qualify with a pair of 4’s or greater to make payouts for winning players hands. If the dealer doesn’t qualify a winning call bet is returned to the player as a push with the Ante bet being paid at even money. The real money can be won by playing the Bonus side bet. I say that because the payouts are better than the Ante Bet returns and also because the side bet is settled regardless of what the dealer has. In the Ezugi version of the game it’s called the Bonus side bet, in others it’s called the AA or Aces or Better side bet. Regardless of what it’s called the side bet works the same everywhere. 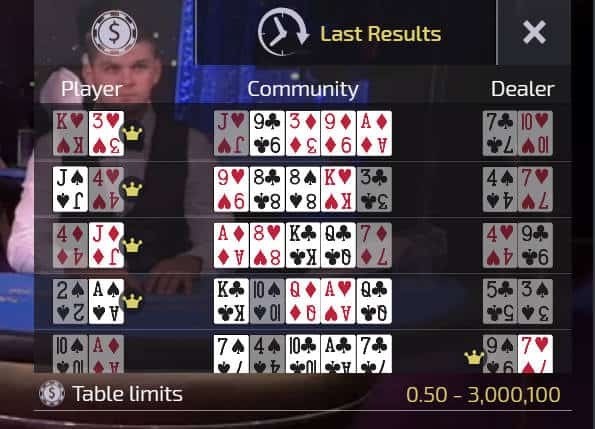 The side bet pays on the two players cards and the 3 cards of the flop. If you get dealt a pair of Aces or better you’ll win a nice payout of at least 7:1. 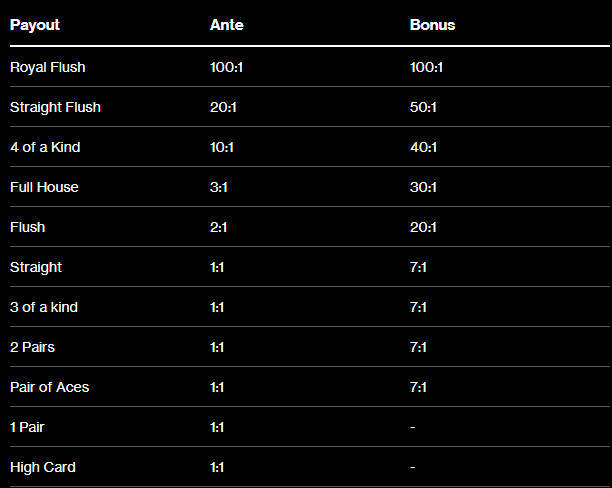 Royal Flushes attract a payout of 100:1, with the more common Flush paying 20-1. 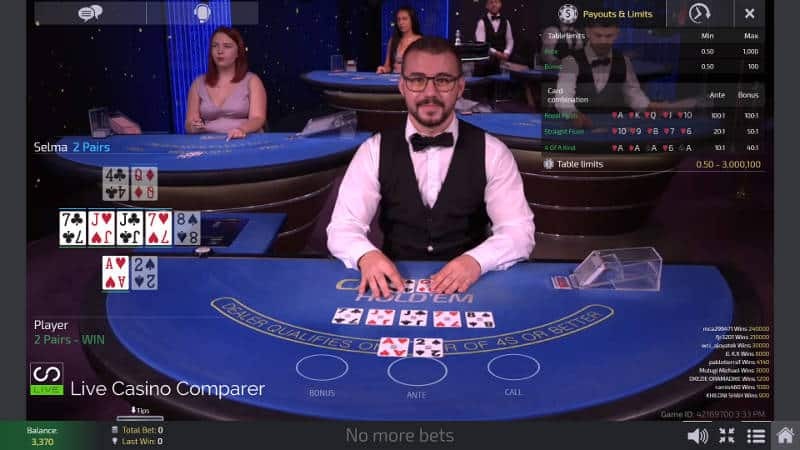 What Do I think of Ezugi Live Casino Holdem? I like the way that Ezugi presents the game. The blue table is one of the nicest table colours to have. The playing interface is nice and clean. The addition of the computer generated images of the cards to one side is a nice touch as it allows you to see the suits of the cards more easily. However saying that, the camera angle for the hands is very good, so there’s no chance that you’ll confuse the cards. The hand history is nice and something I use often as the game speed is very quick. Betting time is set at 20 seconds. Decision time is short so you have to be quick to play or fold your hand. I have one criticism and that’s with the decision buttons. They are not very clear and are easy to miss if you’re not paying sufficient attention. I’ve been guilty of not concentrating and having my hand auto folded because I didn’t act in time.